my Scribbling « My own scribblings !! Modi is the current unchallenged leader of the BJP. He wasn’t one before the run-up to the 2014 elections. His prowess in Gujarat, no i don’t mean his economic or development agenda, i mean his autocratic rule there, and polarizing effect that helped him get elected thrice, propelled him to the central stage. BJP is a political party that is sculptured out of hatred, by its progenitor, the RSS, the original fountainhead of hatred towards non-Hindus in India. RSS was founded on the basis of divisive politics, with deep rooted hatred for the muslims in India. It may have fostered alternative thought, but its domineering intention has always been a Hindu rashtra, ie Hindu nation. A nation where citizens of other religions are subservient, and even all Hindus are not considered equal. BJP was born out of this holy matrimony, marriage of religious bigotry and fascist ideology. And the current chief Modi, and his handmaiden, Shah; and between the two of them they rule the party, as much as they rule the country. Modi is not the first such leader. There was Advani, and also Vajpayee, among others. But the difference was that Vajpayee was head of a government that held power thru; coalition. Advani never really was able capitalize on his hate politics. All the rath yatra, communal violence and the final bludgeoning of the Babri Masjid, didnt deliver him the seat of power, that he so pined for. So Modi was the first leader of this rightwing, and now autocratical party, and also managed to convert the hate into votes, riding on people’s frustration with corruption. My fears came true, soon after he began his authoritative control of the government. First target was the media; attack it, with a new term, “presstitute” invented even before the invention of “fake news” by Donald Trump. And the media allowed itself to be raped. Many simply gave up and became cheerleaders. Some that tried to stay neutral were again bulldozed by power to tone down the criticism. It was important to silence the voice that had most influence. They also started the assault on minorities and alternative thinking. The muslims were attacked on the pretext of cow protection. The dalits were told their position or beaten into submission, to stay in line with the age old caste system. The left leaning thinkers and independent critics were labelled anti-national. All of these were similar tactics, tried and tested during the early stages of the third reich. Yes, by the monster of the early 20th century; Hitler. Modi and his accomplice ran this blasphemy to cure corruption in the country, but actually meant to change the cultural makeup of the nation. It was no longer required to be polite or politically correct in dealing or addressing issues of the minority. The Hindu majority was under threat, the Hindu god in danger everywhere, the age old Hindu traditions and customs that typically included subjugating the dalits and lower castes were being challenged; all of these need to be protected. Hinduism was given a new modern name, Hindutva! To me Hindutva meant terror. They even painted Hanuman with an angry face. Just like in the early periods of Hitler Germany, the society had become more vocal about protection of majoritarian rights. Our culture was under duress for all these many years, because of political correctness, and appeasement of minorities. Fence sitters switched sides. All this new righteousness and need to protect our own, caused many to contemplate and remain mute. A few that opposed verbally were abused at all forums, vocally and sometimes physically. The law that was meant to protect against such tyranny, lost their spine, in the quest for evidence. And evidence if any, conveniently disappeared just before application of justice in the court of law. Institutions granted insular autonomy, and built to guard society against these very swings in thinking, were staffed with likeminded thinkers, and quietly but steadily contained. Befuddled citizens are fooled by this pursuit of fairy-tale and utopian goals. Politicians earlier too had swayed the masses with the same opium. Country that is free from corruption, upliftment of the downtrodden, development and jobs for all, patriotism and national pride, and if all these fail, there is always the TINA, ‘there is no alternative’ factor. All of these can be used to make allowances for Modi and his gang. They too are just like other politicians hungry for power, and only attempting to fulfill personal gains. No! They are not just that. They are also a poison that was nurtured and raised in a cradle of hate. They have combined communalism and fascism, along with the other virulent traits of politics, to create a monster so similar to the ones that lead to the rise of the third reich. History teaches us a lesson. And yet it repeats itself, as the adage goes. Will we learn soon enough to stop it, or learn after it has repeated itself, is left to individual judgement. Talk about a deja vu. I am not talking about those recurring dreams, the ones that pops up and cause me to wonder for a few hours, only to drop off the horizon soon after, till it would appear again, the next blue moon night. I am talking about memories, thoughts and feelings, that hit when the consciousness is as awake as it can be. I go thru’ these moments often enough to think that i am a tortured soul. One that cannot learn, or fully move on. I must think the same for most of us. But i have shared this puzzle with no one, or maybe just one, or two. There are moments when memories strike me and tear my heart. Or one that make me cringe thinking of something i have said or done, and havent fully atoned. Fond memories of fun filled days, and wondering if they can ever be relived. And the wasted time contemplating about the paths never taken, and the resulting whataboutery that shoots out it. Like a dream that animate ones senses, steadily racing the heart into breathlessness, all while in deep sleep; these moments creep into the cortex. Like a dream, they may seem to linger in enternity, yet the disturbance lasts but only a few seconds. I shudder out of it, into the present. The damage though lasts a while. I remember some very particular and exacting moments in my life. There are few that haunt me from when i was very little. Some memories are so vivid, that i can recall minute and fine details. Like i am seated on the petrol tank of my dad’s bike (rajdoot), and we are just about headed out to a night show, just dad and son. I was probably about 2 or 3 yrs old. Or the time when my friend (pre-kg then), told me I will die, because i bit and drank juice from the climber vine of a plant. I cried non-stop that evening after school, thru’ the night till i fell asleep. My neighbor tried to help amd gave me some ‘kissan orange squash’, saying it was a medicine that can cure death. Or when friends and i spending two days in Kodai, except that it was not enough. Or the time i ditched my friends and ran after a lost cause, that was never there to begin with. Heart wrenching sorrow, that i thought i would never overcome. Fun and joy, that i thought were never enough. Fear and horrifying flashbacks that still spook me. Loathing and outrage for something gone wrong or done to me or others. Beauty that couldnt be captured in a camera, but is still lucid and very comprehendable. An act of bravery or foolishness, that i dont know how and why, but am still alive to recollect. Embrassments that still leave distaste, disgust or a smile. What triggers this reaction? Why is the brain so active otherwise, filling up with moments from the past? And not all moments, just fleeting bits. Yes there are moments when i can recall more than a few seconds of the script that was played out. Why do i have to wander back on paths treaded before? I am happy where i am. I am happy knowing what or who i have become. Yet i think, sometimes, only so rarely tho’… why? Pariyerum Perumal – A tale of two tumblers! November 2, 2018 6:35 pm / 2 Comments on Pariyerum Perumal – A tale of two tumblers! Rarely do you get to watch a movie, that kindles a flame that almost was dead or dormant inside of you. One of the recent ones that did this to me was ‘Pariyerum Perumal’, a poignant tale of two tumblers. Discrimination on the basis of caste is a pan-India phenomenon. Each State and region rival each other, in unique ways to shower hatred, and artificially segregate humanity on the basis of family they are born into. While the caste system, talked about so glowingly in our Vedas, simply parcelled people into four piles, the reality of the society allowed these to mutate into a thousand variants. A specific hierarchy and order was tacitly enforced upon them, creating a basis of hate that was permanently etched in our minds. These lines only seemed to get thicker and clearer over the centuries. Two different tumblers (glasses) used to serve tea; Segregation. One such system practiced in some parts of Tamil Nadu is the two-tumbler system. Local tea shops served tea in two different tumblers (glass), to the people from higher and lower castes. This allowed people to partake tea from the same place, but didn’t require sharing utensils, and therefore allowed the so-called upper caste folks to maintain their sanctity. In less than two and half hours, the narative presents the lives of the people who are afflicted by the curse of this division, leaving little to be imagined. Tact is employed very effectively, which i think is an attempt to maintain a sense of propeity and decency. All this while still not trying to diminish the impact, or more importantly the helplessness of the situation. There is no easy resolution to this problem. The first rule of finding a solution to a problem is the acknowledgment that the problem exists. This it effectively does. At the end of the movie, if anything you will no longer question this basis. And therein probably lies the answer. Maybe, just maybe we will work torwards fixing it. Final Shot of the movie; symbolising hope? The last few scenes of the movie, provides you rationale to change thinking and begin a journey towards a more integrated and inclusive society. The two-tumbler system is possibly dying a slow death, but differences continue. This is evident from what is in the tumbler (glass). Tat Tvam Asi – Only for Men? October 12, 2018 1:05 pm / 3 Comments on Tat Tvam Asi – Only for Men? 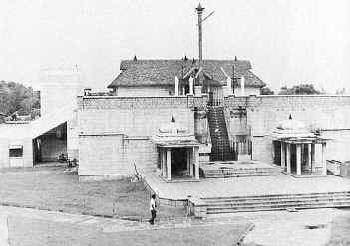 An old picture of Sabarimala, showing the entrance to side. There is another entrance to the rear too (can’t find pictures). These entrances were used by “all (men and women)” who didn’t observe the 41day vradham. Women of all ages were allowed entry at one time thru’ these steps. As i type out these thoughts, we are in the midst of celebrating Navaratri. Nine days, when Durga and her manifestations came down to earth to slay a demon, that no one else could. Among many other things, Navaratri is also reverently proclaimed by many Hindus as the celebration of woman. As a mirror to show how we, since i am also a Hindu, hold women in high esteem. But these things apparently only are words, and not necessarily translated into real emotions or observed. In Kerala and in a few other parts where there are Malayalees who are supposedly devotees of Ayyappan are holding protests against the Supreme Court ruling to allow women of all ages to visit the Sabarimala temple. Ironic it is to me. But then a quick look at the crowds, show women coming out in large numbers to show that they too oppose this ruling. Women in India, and in general, have never hesitated to let their kind down, when it comes to gender issues. They are quick to follow the instructions belted out by men. And here again is a clear case of how powerful men in the religion control the rituals at the temple. Sabarimala is not a gender issue. It is not about women and men. Because women are allowed, except those from the ages 10-50. Why? Because women in this age group, menstruate. And apparently since the deity at the temple, Ayyappan is a Brahmachari, these women will be a distraction to him. They will force him to break his penance or prayer. I have tried to rationalize their feelings and their opposition to this. The more i have searched, and tried to, i have only learnt how ridiculous their arguments are. And how they have kept shifting the goalposts, with the singular objective to keep the current abhorring tradition alive. The Supreme Court has ruled that all, i repeat ALL people, can be allowed to visit and offer prayers at Sabarimala. The temple already allows members of all faith, irrespective of religion to come and offer prayers. The temple opens tomorrow. I wait with a prayer on my lips that the ruling is allowed to be enforced. That anyone and everyone who wishes to visit the temple is allowed to do so. Let the truth be available to everyone. Women were allowed to visit Sabarimala, till the ruling of the Kerala High Court in 1991. Therefore, we need to welcome the re-entry of women to this temple, instead of attempting to hold on to rituals and traditions that have little bearing in today’s world. Specially since they were invented in the last few decades. I recently had the oppurtunity live and experience this old adage in person. And, I have to say, some of it literally. Kerala had been ravaged with water and floods from incessant rains. Rains caused rivers to flood, dams had to be opened to prevent accidental breach, which added to the misery. As a malayalee, and with lot of family and friends in Kerala, i was waiting to head out there and help. A group of youngsters from Thuvakkam, an NGO that my office and i work closely, were developing their own plans. They got the ball rolling, thanks to some seed money and with help of a friend and mentor, they were quickly spreading the message, soliciting additional funds and more importantly assembling material required for relief and rehabilitation. The D-Day was to be 24th friday. It was later shifted to the day after, given that materials were still pouring in. A huge number of volunteers showed up to help, many known and familiar, but many more that were just there for a day, a few hours or a few days. Faces that will never be seen again, names that might be recalled, but the warmth and love that will never be forgotten. I heard later about one that came by to offer food for the night, and ended up staying and helping thru’ the night into the wee hours of the morning. Final D-Day was Sunday, 26th. The 20-feet container truck was to leave around noon, accompanied by a 14 seater van full of volunteers. The truck left around 3:30pm, almost filled to the door, on an arduous journey from Chennai to Coimbatore, with a quick sleepover, so as to begin again from there unto Wayanad. The plan was to arrive by mid-day to begin distribution, and possibly return by that evening.` The truck and the van, arrived late. Very late. A detour, misplaced info from google maps helped in taking more time than required. The whole of monday was lost in travel. That left Tuesday to unload and distribute. Any plans to unload the materials at a location for distribution by others, was squashed by the District Collector’s office. They had enough on their hands, and was only too happy to heed to the team’s request to distribute directly. The loaner of the truck had originally wanted it back by Monday night. If you thought that was all, that was working against us, keep thinking. To make up for this lost time, we knew we had start early on Tuesday. After a tiresome almost 24 hours of travel, it seemed impossible. But these kids were determined to do just that. They were up and ready early on Tuesday. It didnt help, because weather, our local coordinators, location and facility to park and unload; all conspired against this plan. A sunny monday turned into a wet and deary tuesday, as if warning us not to attempt the impossible. With less than 12 hours at hand, the team unloaded the entire truck, distributed materials to over 2000 families, with help from the local coordinators called “Promoters”. Each promoter, accompanied by a volunteer took off on a jeep, the only vehicle that could traverse the terrain easily. Jeeps moved in and out of the makeshift load/unloading facility; a boys hostel with half a shade to block the rain. Rain coming in bits and pieces, just enough to irritate, and add to the misery. I left the team there (i had to leave that afternoon), a lot guilty, but with some semblance of a backup plan. My scare for any kind of partial or unfinished work, was misplaced. The team was resolute in finishing what they had started. They were not about to be fazed down by the challenges presented. With everything having gone wrong in the first half of their trip, the second half was about making up with sheer will and grit, overcoming anything and the everything that came in their way. Later almost a week after, when we gathered to share our experiences, a member of Thuvakkam provided an explanation that made me understand things a little better. All the love they collected from donors, all the warmth they accumulated from volunteers, and all the spirit of the people they encountered also conspired, to take on the forces of nature, plans that went wrong and mountains of work to be completed. Ultimately, what tipped the balance in the team’s favour, was the faith they held steadfast; faith that they will complete this, and they will not let people who gave and the ones that were to receive, down. Faith did work. It helped overcome any fate that was planning otherwise. And very typical of Indian tradition, people here do not speak ill of the dead. As a result of this or otherwise they miss this ‘statesman’. Why? Because compared to the current regime and autocrat ruling the country, he appeared a little more timid or sane. But look a little more deeper and you will see the rot he prevailed upon. 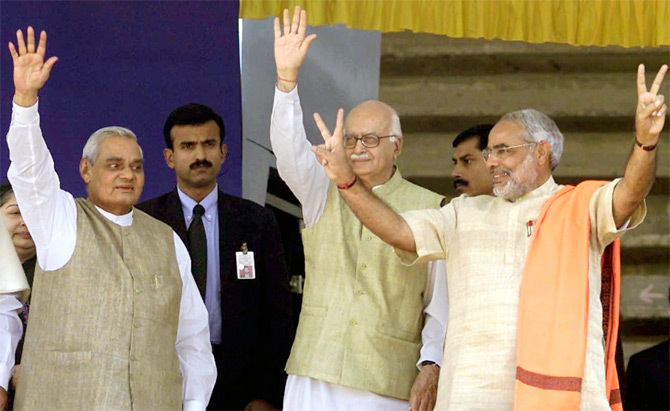 How did the BJP come to power, that resulted in Vajpayee becoming the PM? It rode on the hate wave spearheaded by Advani, in the form of a Rath Yatra. And everywhere this vehicle went, it spewed hatred and violence against the muslims and other minorities. Hinduism was being replaced by a more hateful thought called Hindutva. Hindu terrorists were being spawned as a result of this hateful environment. And yet we think Vajpayee was a statesman. This statesman was at the helm of the country, when Gujarat burned under the influence of the then Chief Minister Modi. The state and government stood by watching as innocent were butchered on the streets in the name of revenge. Muslims that is. And we are told stories of how this man wanted Modi government dismissed. Yet as i recall, he and his goverment in the center uttered not a single word to stop, instead he adviced Modi to follow his “Raj Dharma”. Modi, the maniac manufactor from the same factory that produced Vajpayee, the RSS. Today with his death, we call him a stateman. Tomorrow some will do the same for Advani and later Modi. Because by then we may have experienced some other maniac, far worse than what Modi and his RSS have done till date. By these standards, i wonder how we should address other monsters that are dead and gone. And whose poisonous acts have been surpassed manifold by others.